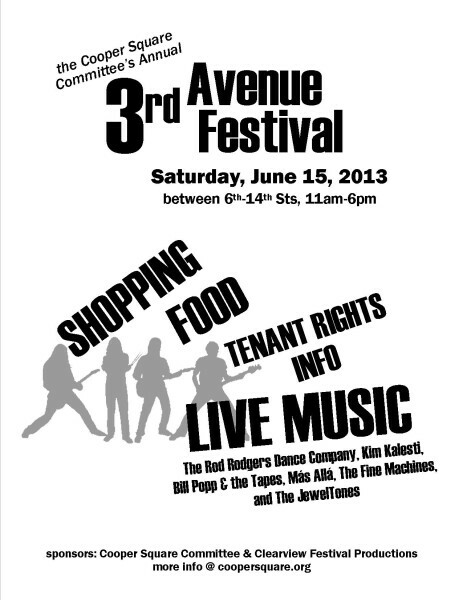 Our Annual 3rd Avenue Festival is tomorrow! And we will have a table at 11th St, with information on tenants rights, Save the Lower East Side and CSC T-Shirts, and more. Questions, call 212-228-8210 or email Steve. 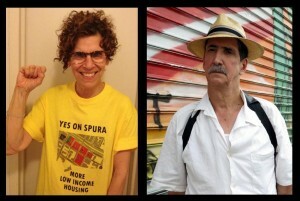 5/21: Fight illegal construction of additional floor and penthouse @ 515 E 5th St! We wish you and yours a rewarding and happy holiday! We are closed Thurs 11/22 and Fri 11/23. We reopen at 10am on Mon 11/26. @ The 4th Street Photo Gallery, 67 E. 4th St.
10 VOLUNTEERS NEEDED FROM 4-6PM TOMORROW (Saturday)! Call us this morning (Friday) at 212-228-8210. Volunteers get a free T-shirt! We will need some help breaking down a few tables and chairs and packing up our material (t-shirts, flyers, fact sheets). It’s light work, but we need some extra hands. Sponsored by CSC and Clearview Festival Productions. More info: 212-228-8210. 17 MARKET RATE TENANTS AT 50-54-58 EAST 3RD STREET HAVE RECEIVED NOTICES FROM THEIR LANDLORD, ABART HOLDING LLC, THAT STATE THEIR LEASES WILL NOT BE RENEWED. THESE TENANTS ARE WORKING PEOPLE WHO ARE SHARING APARTMENTS TO BE ABLE TO AFFORD THE RENTS. ACROSS THE STREET THREE YEARS AGO A LANDLORD EVICTED THE WHOLE BUILDING FOR HIS PERSONAL USE! STOP THE EVICTIONS-SUPPORT THE TENANTS AS THEY FIGHT BACK! Come learn about the proposed cuts to HUD funding and how you can help protect the long-term affordability of your development. The Bowery Alliance of Neighbors, Two Bridges Neighborhood Council and Historic Districts Council are sponsoring a walking tour of the Bowery in conjunction with the Historic Districts Council’s “The Great Outside: Preserving Public and Private Open Spaces”Conference. All are welcome on the tour, which is free of charge! On Sunday, January 15th, Mary Spink, who had been battling a failing liver and kidneys, died at Beth Israel Hospital. 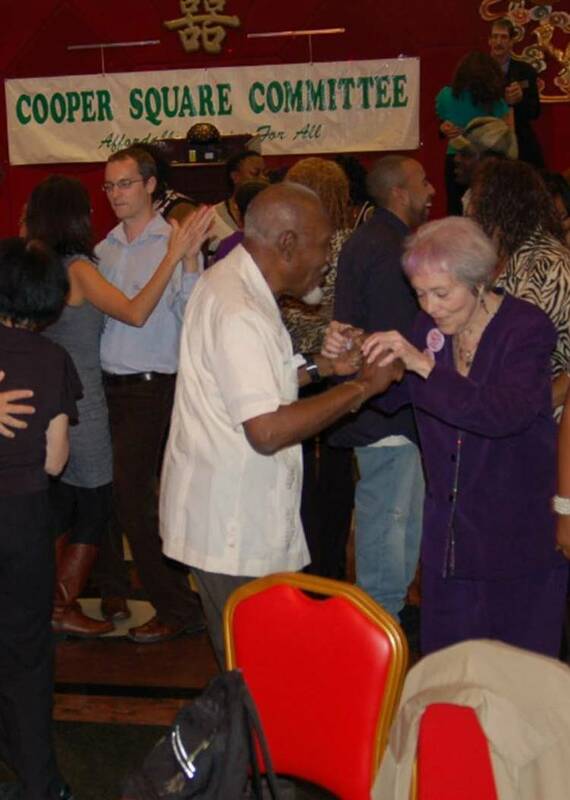 She was Executive Director of Lower East Side People’s Mutual Housing Association, an organization that renovated and built affordable housing in Manhattan’s Lower East Side. Our colleague Fourth Arts Block (FAB!) is holding an interactive festival on Saturday, September 24th, from 1pm-5pm. Come participate in our interactive “Go Green” project at our table in front of 61 E. 4th Street. Also, have any ideas for interactive presentations we can do at future events? For example, at last year’s Festival, we mapped housing and income data in NYC’s neighborhoods. Let us know. the more than 100 people, including elected officials, who attended. Various types: knit fur-trimmed & metallic-knit, both with attached neck scarf, fleece, knit, cowl head wraps, evening pillbox hats, and more. Not shown are various restaurant, lodging, and other items available. Membership Meeting – Wednesday 4/27! We invite you to attend our Membership Meeting on April 27th to learn more about our 3 Year Strategic Plan and help us review how well we are implementing it. We will be giving a powerpoint presentation of our programs and services, and discussing how we can achieve our strategic goals and objectives during a time of severe budget challenges. We will be focusing on the four topics below. We welcome your input! 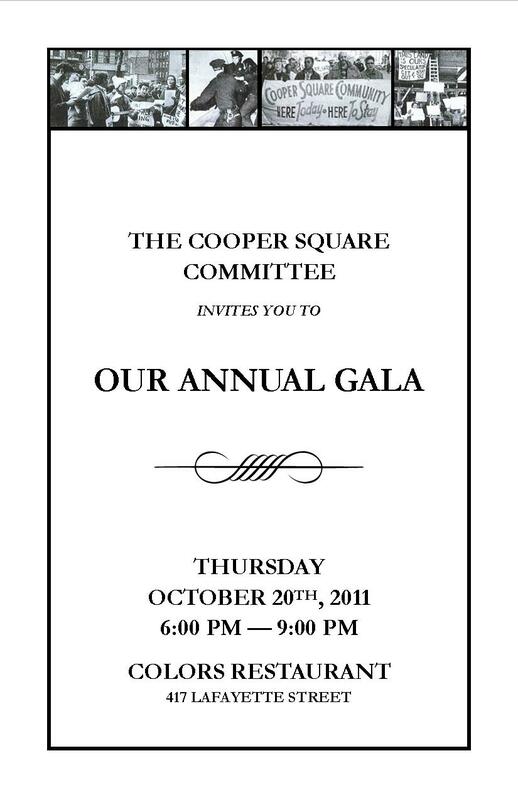 If you are not a dues-paying Cooper Square member, you will be asked to pay dues for a year upon entry (only $1!). Come find out what we have planned for 2011. There will be refreshments and a 50/50 raffle. Come and get involved! 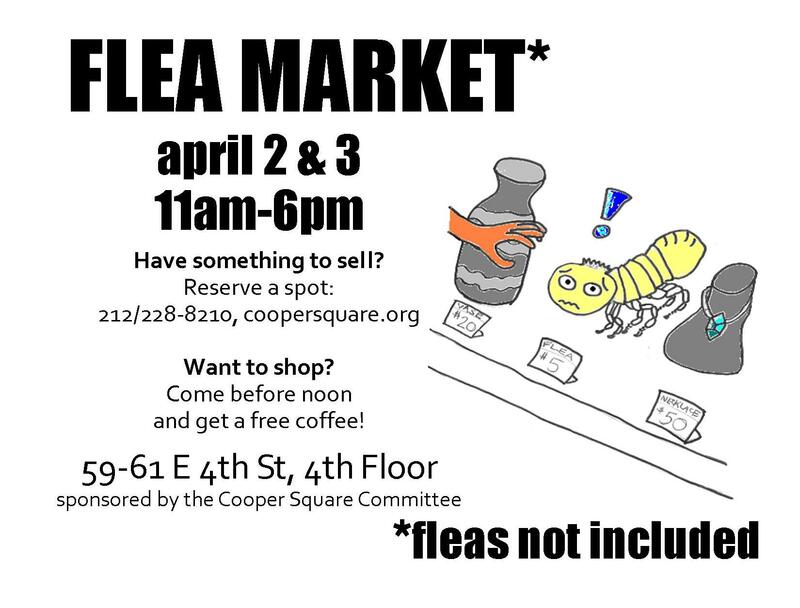 The Cooper Square Committee is hosting a Flea Market Fundraiser on Saturday, April 2nd and Sunday, April 3rd from 11 am to 6 pm, at 59-61 East 4th Street, in an 1,800 sq. ft. loft space. We expect to have about 20 vendors selling jewelry, collectibles, crafts, clothing, art work, cd’s and dvd’s. 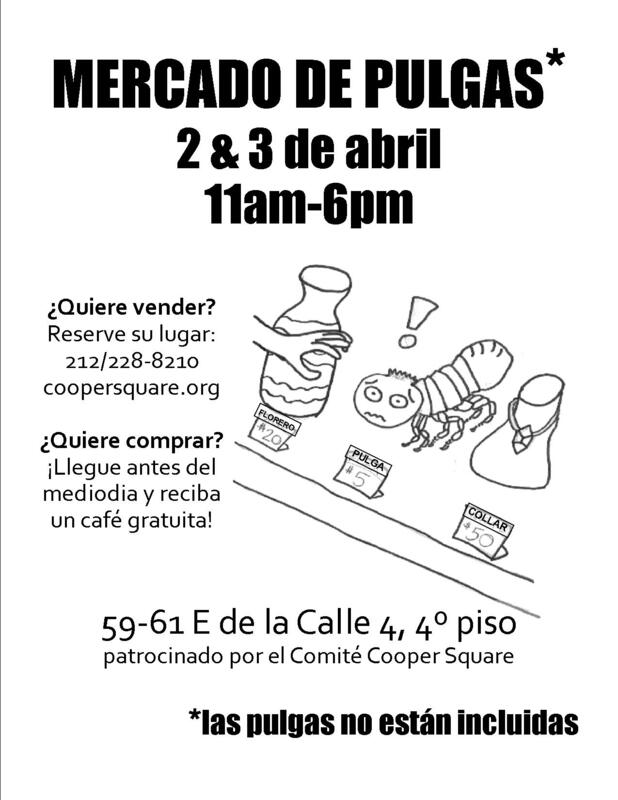 If you would like to be a vendor, we are renting tables (4 feet wide by 2 feet deep) for $25 per day. Click Donate on the right to register. (write on the 2nd screen which day(s) you want to sell on, and what you are selling) We will be in touch with you to confirm your registration. Alquilamos mesas por $25/día. Haga clic en el botón Donate al lado derecho para registrarse. (escriba en la segunda página en cual(es) días quiera vender, y lo que quiera vender) Entraremos en contacto con Ud. para confirmar su registración. 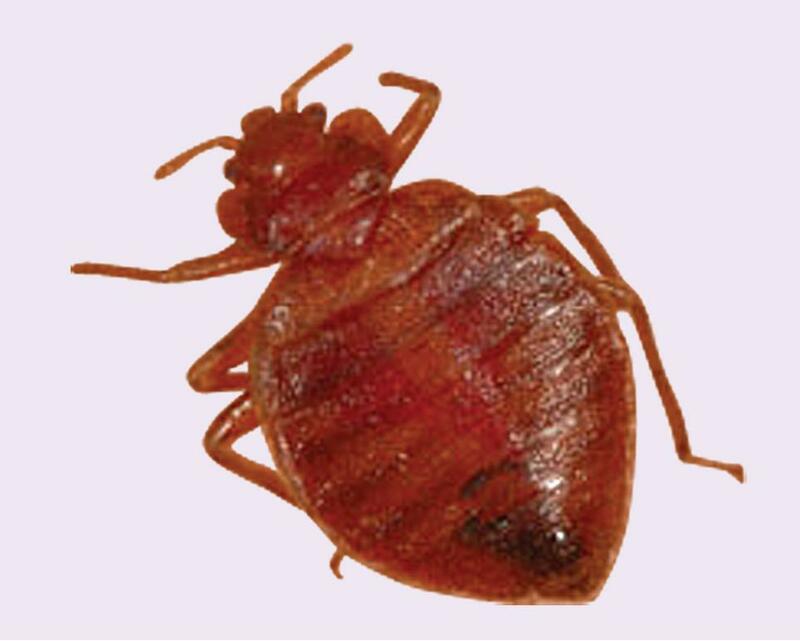 Para más información, llámenos al 212-228-8210. 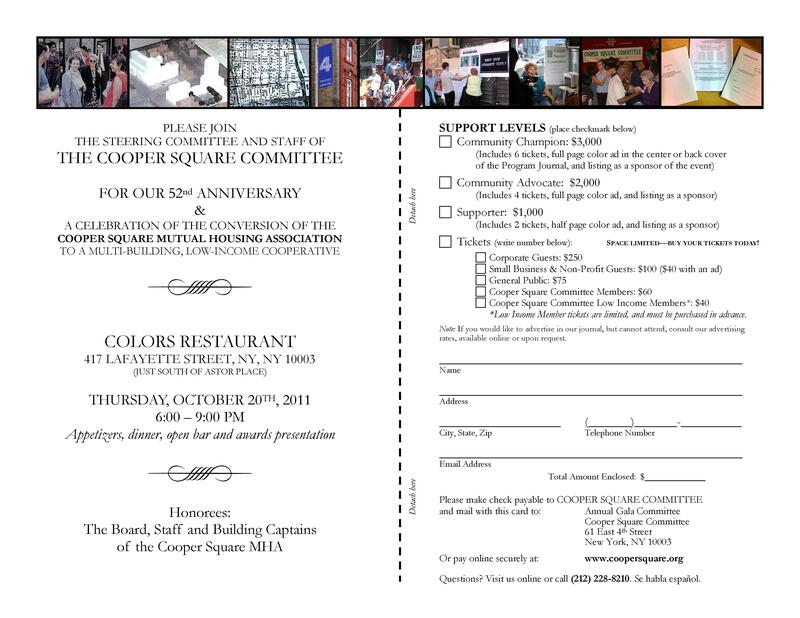 Candlelight Vigil: Save 35 Cooper Square! Take a community stand against overdevelopment and the profiteering that destroys community and local character. This is about much more than just one historic townhouse. With our rent stabilization and rent control laws expiring in four months, please send a strong message to your legislators – they must preserve our rent protections for this generation and the next! All buses leaving at 10 AM SHARP this Saturday, February 19th!!! The bus returns in the early evening!! !